Kate Giammarise, reporter for the Pittsburgh Post-Gazette who covers low-income communities. Pennsylvania's new Secretary of Pardons Brandon Flood in Harrisburg on Monday, April 8, 2019. The city has included more affordable housing in recent development projects, but Redwood says it's not nearly enough. "We use words to say we're doing something, but the situation keeps getting worse," he says. "There is no housing market... that is a good housing market for black people.” Redwood says there are initiatives in other cities, like Chicago's low-income trust fund, that could work for Pittsburgh. Lt. Gov. John Fetterman announced on Monday the appointment of Brandon J. Flood as the new Secretary of the Pennsylvania Board of Pardons. The board recommends whether someone convicted of a crime in Pennsylvania deserves to be pardoned under Gov. Tom Wolf. Flood served nine years in a Pennsylvania State Prison on drug and gun offences before being pardoned himself. 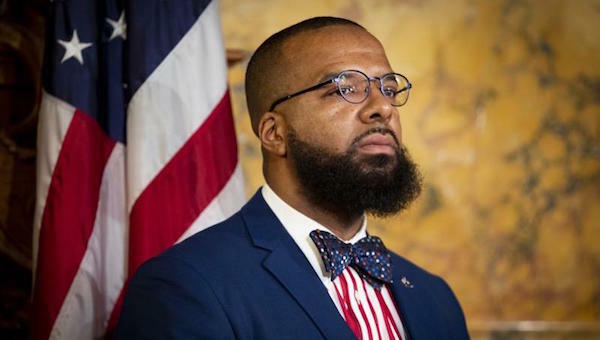 Flood explains his personal turnaround from young drug dealer in Harrisburg to holding a government position, as well as how the pardon application process has changed since his own came through. Flood says he's working towards greater accessibility of pardons and clemency for all Pennsylvanians. The Christmas Eve fire at Clairton Coke Works is still affecting the air quality of the region nearly four months later, according to Clairton residents. The Allegheny Front’s Reid Frazier spoke with parents, kids, senior citizens and workers still struggling with the poor air quality. And since 1948, Homewood-based Jones Printing has been designing, crafting and manufacturing products for companies throughout Allegheny County. The brick-and-mortar business faces challenges in an industry that is slowly moving online. As part of the Built in PGH series, WESA’s Katie Blackley reports on how Jones Printing is working to adapt. An Allegheny County jail inmate has died. Timothy Pauley, 34, of Weirton, W. Va. had attempted suicide on Sunday and was found unresponsive in his cell. Pauley was transported to UPMC Mercy Hospital where he died Thursday afternoon. The county medical examiner has not yet issued a cause of death. The Pittsburgh Post-Gazette reports Pauley was facing a homicide charge in the December death of 48-year-old Thomas Garner. A national network of clinics specializing in eating disorders is seeing more women struggling with anorexia nervosa, bulimia nervosa, binge eating disorder and related mental health issues in mid-life than ever before, Oakland site director Erin Wentroble says.